The 2004 United States presidential election in New York took place on November 2, 2004, and was part of the 2004 United States presidential election. Voters chose 31 representatives, or electors to the Electoral College, who voted for president and vice president. New York was won by Democratic nominee John Kerry with an 18.3% margin of victory. Kerry took 58.37% of the vote to Bush's 40.08%. Prior to the election, all 12 news organizations considered this a state Kerry would win, or otherwise considered as a safe blue state. The last Republican presidential nominee to have carried the state of New York was Ronald Reagan in 1984. As of the 2016 presidential election[update], this remains the last presidential election the Republicans won over 40% of the vote in New York. Despite being a "safe blue state", this was the best showing for a Republican candidate in New York since 1988. This can largely be attributed to increased support for President Bush after the 9/11 attacks. Kerry won every single pre-election poll, and all but one with a double-digit margin and with at least 49%. The final 3-poll average showed Kerry leading 55% to 38%. 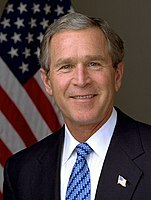 Bush raised $11,994,227. Kerry raised $27,733,309. Neither campaign advertised or visited the state during the fall campaign. The voters of the five boroughs of New York City were the main force responsible for Kerry's decisive victory in the state. Kerry won New York City by an overwhelming margin, taking 1,828,015 votes to Bush's 587,534, a 74.99% to 24.10% victory. Excluding New York City's votes, John Kerry still would have carried New York State, but by a reduced margin, taking 2,486,265 votes to Bush's 2,375,033 votes, a 51.14% - 48.86% victory. The New York suburbs consist of Long Island, Westchester and Rockland counties. Traditionally Republican, this area went clearly Democratic through the past few decades, with the arrival of people from New York City. However, in this area where many voters commute to Manhattan, Bush did better than expected. Although he clearly lost these counties to Gore in 2000 with 39.55% to 56.42%, or 655,665 votes to 935,456, he only lost them by a close 46.13% to 52.30% to Kerry. While Bush won 167,397 more votes than in 2000, Kerry lost 2,437. This can be mainly explained by the concerns of suburban moderate voters about terrorism, an issue about which they trusted Bush more than Kerry. Upstate New York region, including all of the counties that are not part of New York City or its suburbs, is the least liberal region of the three. Its politics are very similar to those of Ohio or Pennsylvania, both key swing states and sharing conservative rural areas. Despite this characteristic, Senator Kerry still managed a slim victory in Upstate New York, with 1,553,246 votes to 1,551,971 for Bush. This was largely due to a Democratic tidal wave in the region's four largest cities--Buffalo, Rochester, Syracuse and Albany. Kerry also ran strongly in college dominated Tompkins County and two counties with an influx of former New York City residents moving to vacation homes, Ulster County and Columbia County. As of the 2016 presidential election[update], this is the last election in which Rockland and Dutchess counties voted for the Republican candidate. Kerry won 20 of 29 congressional districts. NY voters cast their ballots for electors: representatives to the Electoral College. New York has 31 electors because it has 29 congressional districts and 2 senators. All candidates who appear on the ballot or qualify to receive write-in votes must submit a list of 31 electors, who pledge to vote for their candidate and his or her running mate. Whoever wins the majority of votes in the state is awarded all 31 electoral votes. Their chosen electors then vote for president and vice president. Although electors are pledged to their candidate and running mate, they are not obligated to vote for them. An elector who votes for someone other than his or her candidate is known as a faithless elector. The electors of each state and the District of Columbia met on December 13, 2004, to cast their votes for president and vice president. The Electoral College itself never meets as one body. Instead the electors from each state and the District of Columbia meet in their respective capitols. The following were the members of the Electoral College from New York. All were pledged to and voted for Kerry/Edwards. ^ "Election 2004 Polls - Dave Leip's Atlas of U.S. Presidential Elections". Uselectionatlas.org. Retrieved 8 October 2014. ^ "Dave Leip's Atlas of U.S. Presidential Elections 2004 - New York". Uselectionatlas.org. Retrieved 2013-01-07. This page was last edited on 18 January 2019, at 21:05 (UTC).